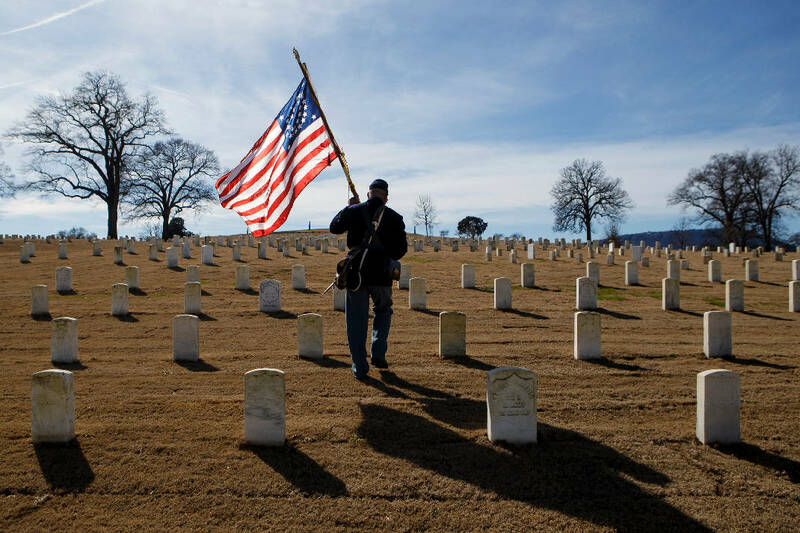 Donald Tatum, a quarter master sergeant in the 44th United States Colored Troops reenactment group, carries a Civil War-era American flag through the Chattanooga National Cemetery before a wreath laying ceremony as part of the Martin Luther King Jr. Day of Service on Monday, Jan. 21, 2019 in Chattanooga, Tenn. Hosted by Unity Group of Chattanooga, along with National Park Partners, the 44th United States Colored Troops reeenactors and the Mary Walker Historical and Educational Foundation, the wreath was laid to honor the members of the United States Colored Troops who fought in the Civil War and helped erect the Chattanooga National Cemetery. Chattanoogans braved Monday's blistering cold weather to serve the community on Martin Luther King Jr. Day. Volunteers spread out across the city, cleaning, picking up trash and holding clothing and food drives. The annual federal holiday marking King's birthday is the third Monday of January and is designated as a "day on, not a day off" national Day of Service. The civil rights leader would have turned 90 on Jan. 15. Students from Southern Adventist University hosted a "street store" at the Chattanooga Salvation Army to help homeless and other people in the community needing free clothes. Charity Sutherland, a junior majoring in social work, said students began collecting items for the event in August and worked throughout the morning to hang clothes and shoes along the McCallie Avenue and Palmetto Street sidewalks. "We have amazing volunteers who are literally willing to go above and beyond — it's freezing cold out here," Sutherland said, adding that more than 100 students and several university faculty members came out to lend a hand. "I think it's really important that we don't help — not only just homeless people, but help people in general — just on Martin Luther King Day," Sutherland said. "Yeah, it's a great day to do it, but we should make it a practice and a habit, because, honestly, seeing the smiles on these people that we're helping is so rewarding. It's a blessing for them and yourself." William Kennemer was one of the people who stopped by to grab some new shoes and a warm meal inside, where student musicians played music. Kennemer said he was living at the recently closed Chatt City Suites motel and has been homeless for five nights while he works out the paperwork for his new residence. Despite being displaced, he's keeping his spirits up thanks in part to God and the Day of Service event, he said. Lauren Russek, volunteer director at the Salvation Army, said around 100 people found items at the street store Monday. Throughout the year, the Salvation Army provides basic need items — toiletries, clothing, blankets, secure lockers, private showers — and helps connect people to other needed services. Russek said that new socks and underwear for men and women are the two most sought-after items. "We'll take any sizes," Russek said. "I usually say things a little bit on the larger size are easier to fit into than things that are too small." Across town in Alton Park, McCallie School sophomores Jordan Bruck and Henry Xu picked up trash and loaded heavier garbage as part of Mayor Andy Berke's Day of Service activities. The students were helping residents in the Piney Wood neighborhood who are busy working, old or disabled, they said, adding that King's legacy remains important and relevant today. "He's trying to send a message to everybody else: Stand up for what you believe in and take action," Bruck said. "Don't just say something and don't do it. Go out there. Do it."